Sprayable Leather Cleaner and Conditioner provides a protective coat that lasts. The fresh scent of leather will make you smile. The Spayable Leather is a rich, lanolin-based cream and a naturally derived propolis with remarkable "suspension release" quality, propolis also provides a durable barrier against chemicals and resists bacteria, mold and mildew. Propolis is an anti-bacterial resin collected by honeybees to waterproof and disinfect their hives. This amazing, all natural substance repels water better and longer than regular water repellants. It even reinforces the surface of your leather against scuffing while still allowing the leather to breathe. The unique Chemical Guys blend prevents the drying, cracking, and hardening that occurs as leather upholstery ages. The preservatives and oils used during the tanning process gradually diminish over time. The Sprayable Leather Cleaner & Conditioner applies like a dream replaces them with pH-correct, natural oils that are absorbed by the leather pores. The Sprayable Leather Cleaner & Conditioner makes leather care efficient and effective while maintaining the unique deep shine every true car enthusiast lusts after. The unique formula was designed to literally be absorbed by the leathers pores to replenish the surface to create an unmatched shine and breathe new life into dry leather surfaces. Keeping leather properly hydrated and soft is the ultimate defense against unsightly cracking caused by sun exposure. 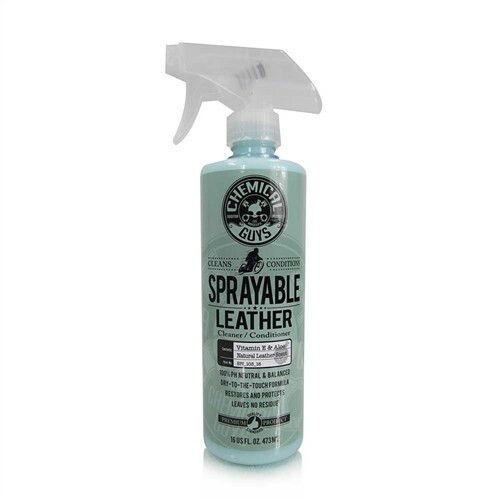 The Sprayable Leather Cleaner & Conditioner leaves leather surfaces smooth, soft, shiny and protected. Sprayable preserves the unique, fresh natural smell, beauty, feel and shine of fine leather forever. It will breathe new life into leather while helping to restore and protect neglected leather. No vigorous rubbing required. Restores the feel and scent of new leather. Nourishes and moisturizes to lubricate individual fibers of leather, keeping them from becoming brittle and dry. Non-greasy and extra dry. Once applied, it leaves the surface clean, conditioned and dry to the touch. Formulated with stain repellants, and waterproofing agents that aid in the protection of leather. The ease of use, unbeatable protection, durability, dryness to the touch, pleasant leather scent and natural supple feel is unmatched. The Sprayable Leather Cleaner & Conditioner in One is also available in gallon size.